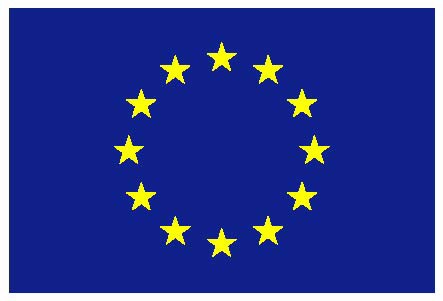 During the recent years one of the most promising directions of research in computational mechanics has been towards the synthesis of the CAD geometries and methods of stress analysis. Since the boundary element method only requires the discretization of the boundary and its accuracy is highly dependent on the accuracy in the boundary representation, the CAD-parameterization of the exact geometry can be directly embedded into the governing equations, yielding highly accurate solutions. Shape optimisation is a process to find the optimal shape of a component or structure under given constraints and objectives. 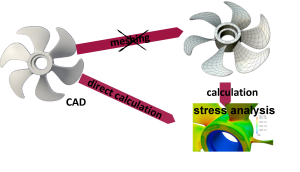 In finite element method (FEM), a mesh must be created to approximate the geometry and discretize the governing partial differential equation (PDE) to allow analysis to be performed. Shape optimization is an iterative procedure and geometries vary at each step, thus leading to cumbersome remeshing procedures, which occupy around 80% of the total problem solving time for linear problems at each iterative step and accumulate to an unaffordable computational burden. Moreover, it may happen in industrial practices that the geometry is so complex that available mesh generators fail, or require significant human intervention, which precludes the automated algorithm. So the mesh burden has become the bottleneck to achieving an automated and fast shape optimization. To solve this problem, the isogeometric boundary element method is applied to shape optimization in linear elasticity. 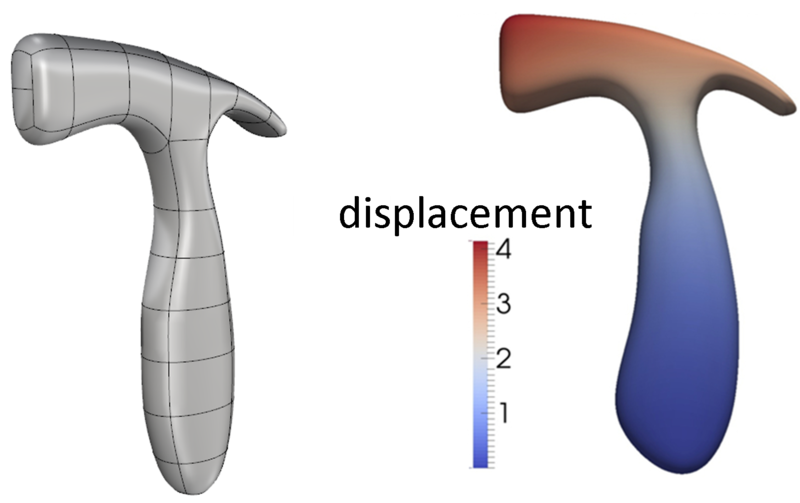 Based on the same boundary representation as CAD, IGABEM can achieve a seamless CAD and analysis integration, which renders IGABEM immediate advantages in the application of shape optimization: 1) the mesh generation/regeneration can be avoided, 2) the automation of the optimization process is more realistic because no human intervention is introduced for constructing analysis-suitable model and meshing, 3) the free-form representation for shape optimization can be naturally reached, and 4) the optimal geometrical model output can be used directly in CAD without any postprocessing or “smoothing” procedure. 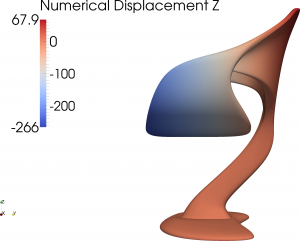 In conventional fatigue simulations as performed industrially using the finite element based methods, the key difficulty is the accurate computation of the crack driving force, namely the stress intensity factors (SIFs). The second dificulty is that the domain mesh used for stress analysis and hence for the detection of “sensitive” regions in the component, where initial flaws are introduced, is typically at least one order of magnitude too coarse to provide quality SIFs. The third difficulty lies in the geometrical complexity of the domain which, if the predicted fatigue life is deemed inadequate must be redesigned. 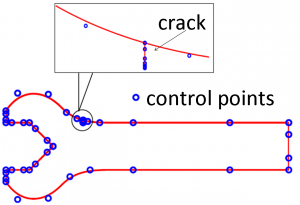 For each new design, and for each crack configuration, a new mesh typically needs to be generated, not only to conform to the new chosen geometry, but also to properly resolve stresses in the vicinity of the crack tip. Even when enriched finite element methods are used, some level of remeshing is required. 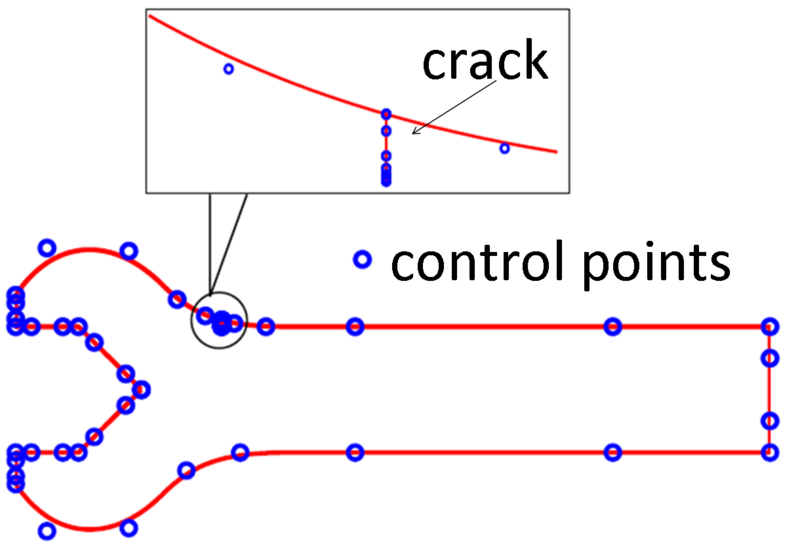 IGABEM is an strong contender to attack fracture mechanics problems, because it requires only boundary discretization, which simplifies the insertion of new crack segments during growth and offers superior accuracy for the computation of the SIFs for the same number of degrees of freedom compared to other methods.